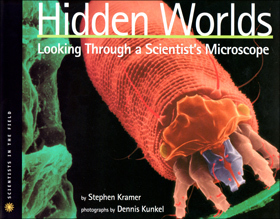 There are hidden worlds in nature—places you can visit only with a microscope. Dennis Kunkel has been exploring these worlds for more than twenty-five years, and now you can go along with him as he uses his powerful microscopes to reveal the hidden beauty of everyday objects: a crystal of sugar, a grain of pollen, a blade of grass. For Dennis, science has always been an adventure, the chance to make discoveries and explore new frontiers. Follow Dennis and author Stephen Kramer through Hidden Worlds and you’ll never see your world the same way again!